The studio, one and two bedroom apartments and penthouses combine the best of contemporary design, architecture and furniture to create a comfortably chic holiday retreat. The stylish resort offers all the five-star services and facilities you would expect from a world-class Absolute development. Dine in private on a terrace cabana or indoors at the Twin Sands’ restaurant, or in the comfort of your apartment. Recharge and relax at the wellbeing spa or ozone pool surrounded by relaxing poolside loungers. Enjoy the use of a fully-equipped fitness centre, sauna and steam room any time you desire. 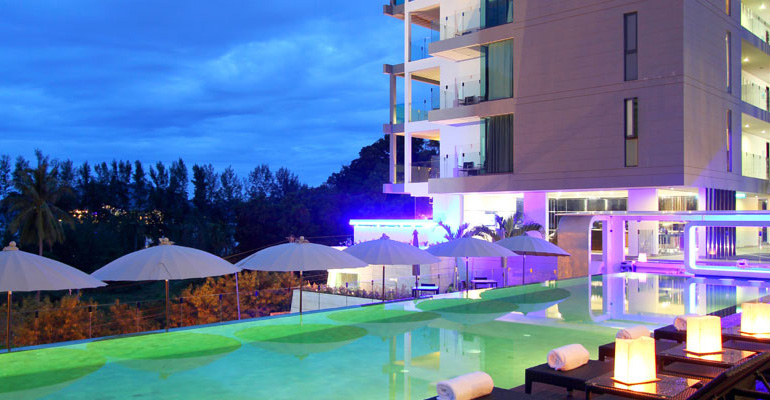 Renowned architects Studio 906, the team behind Absolute Nakalay Beach Resort and yooPhuket, have carefully designed Absolute Twin Sands to create optimum sea views across the peninsula from each of the carefully designed apartments. The building itself uses material layers of glass, stainless steel and textured stone, with water and stunning tropical vegetation, to create a facade that blends perfectly, yet impressively, into the surrounding landscape. Stunning sea views, private balconies, luxurious contemporary interiors are all standard at Absolute Twin Sands. Phase 1 of the apartments are currently available to purchase off-plan with the resort ready to open in 2012. Phase II and III launching in succession.